Welcome to year 2018! Sunsigns.Org is happy to offer you 2018 January monthly horoscopes. January month ushers in the New Year and everybody is anxious to know what is in store for them in the coming year starting from January. January Horoscope 2018 provides a quick look at the likely happenings in the month of January for the different zodiacs. It presents you with brief and accurate predictions about the various aspects of life such as career, finance, love and social relationships and health. It covers zodiacs from Aries to Pisces and the influence of the various planetary aspects and movements. 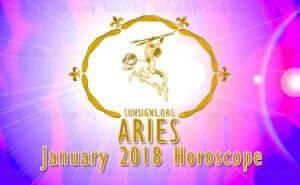 January 2018 for Aries sun sign predicts that career interests will dominate over family concerns. Saturn will create problems in career development. Earnings will be good with the help of social contacts. Love relationships are in the background and health will face some problems initially. Click here to read full January 2018 Aries monthly Horoscope. The only bright aspect of life for Taurus star sign for the month of January 2018 will be the excellent health you enjoy. Family environment is turbulent, finances face rough weather and career prospects are not very bright without the support of the family. 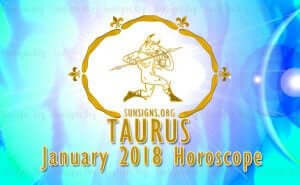 Click here to get a detailed reading of 2018 Taurus January Horoscope. Career development will be good for Gemini zodiac during the month of January 2018. Social and family lives will be stimulating. While health is showing some progress, finances tend to be sluggish. Singles can look forward to form new relationships. 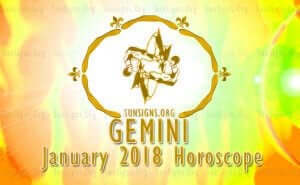 Click here to get a detailed reading of 2018 Gemini January Horoscope. Predictions for Cancer zodiac sign indicate that your life is governed by others this month. Finances and career will be under turmoil and you have to be patient. Mars and Pluto are creating confusion in family life. You have to struggle to maintain your health. 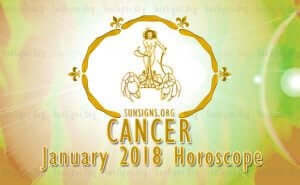 Click here to get a detailed reading of 2018 Cancer January Horoscope. Leo sun sign has to limit his aggression in the month of January and can achieve results by being flexible. Life with your spouse and family will be quite fabulous and finances are profitable. Career is hindered by Mars, but health prospects are wonderful. 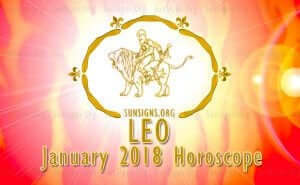 Click here to get a detailed reading of 2018 Leo January Horoscope. Virgo sun sign should use their social skills and adaptability to succeed in the month of January 2018. Health will be fabulous and love life will be very peaceful. Health will be without blemishes, but career environment is volatile. 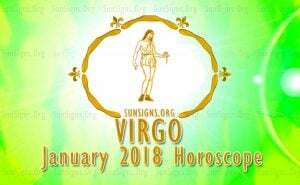 Click here to get a detailed reading of 2018 Virgo January Horoscope. Life for Libra zodiac will be affected by the solar eclipse and emotional factors in the month of January 2018. Financial earnings will be wonderful and at the same time your expenses also will also mount. Love life and social environment will be chaotic. Health prospects are better after the third week. 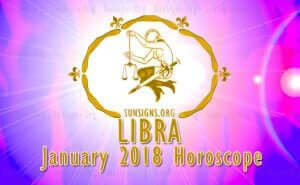 Click here to get a detailed reading of 2018 Libra January Horoscope. 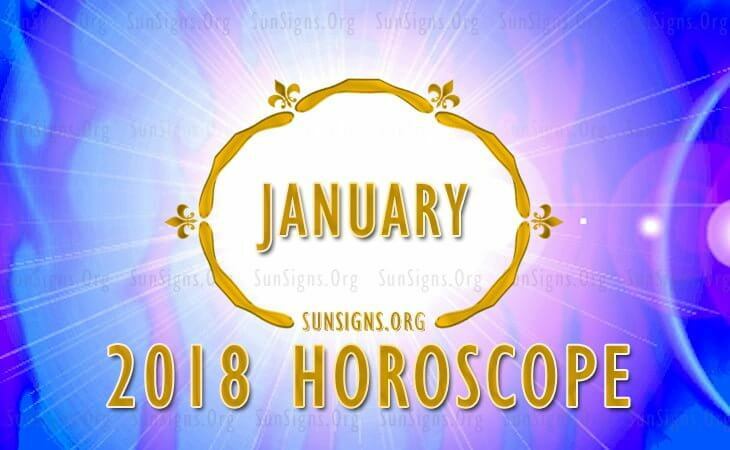 January 2018 forecast for Scorpio sun sign predicts a fantastic time for finances and marital life. Career issues will be in the planning stage. Health will be very good till the 20th. For people in relationship, your active social life will create problems. 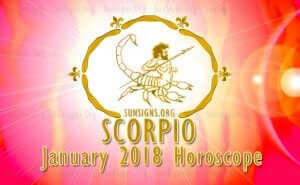 Click here to get a detailed reading of 2018 Scorpio January Horoscope. Sagittarius astrology sign can expect many wonderful things in the month of January 2018. With some diligence, you can achieve your financial goals. Jupiter promises happiness and fun in personal life. Love life with your spouse will be fantastic, but the retrograde of Mercury will affect your career growth. 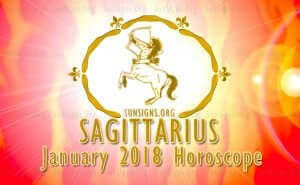 Click here to get a detailed reading of 2018 Sagittarius January Horoscope. 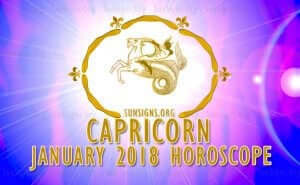 Capricorn star sign can expect a progressive month for career as well as family affairs. You will accomplish your career goals and financial earnings will grow enormously. Love life will be harmonious for the married in pregnancy issues and singles will make new relationships. Health will be good with proper diet and exercise. Click here to get a detailed reading of 2018 Capricorn January Horoscope. Financial prosperity will be fabulous for Aquarius star sign in January 2018. Life with your spouse will be turbulent, while health will be normal. Career growth requires more hard work. Jupiter will help you to accomplish your financial objectives. 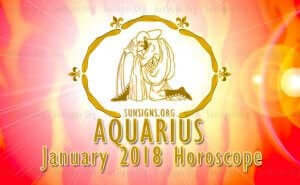 Click here to get a detailed reading of 2018 Aquarius January Horoscope. Jupiter will ensure financial success with good earnings for Pisces zodiac sign in January 2018. Solar eclipse will affect your social life, but single will succeed in getting into new love relationships. Health will improve with a good fitness routine and career will progress with family support. 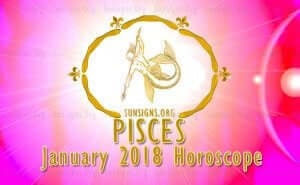 Click here to get a detailed reading of 2018 Pisces January Horoscope.